It is also a very popular meal in the rest of Europe. 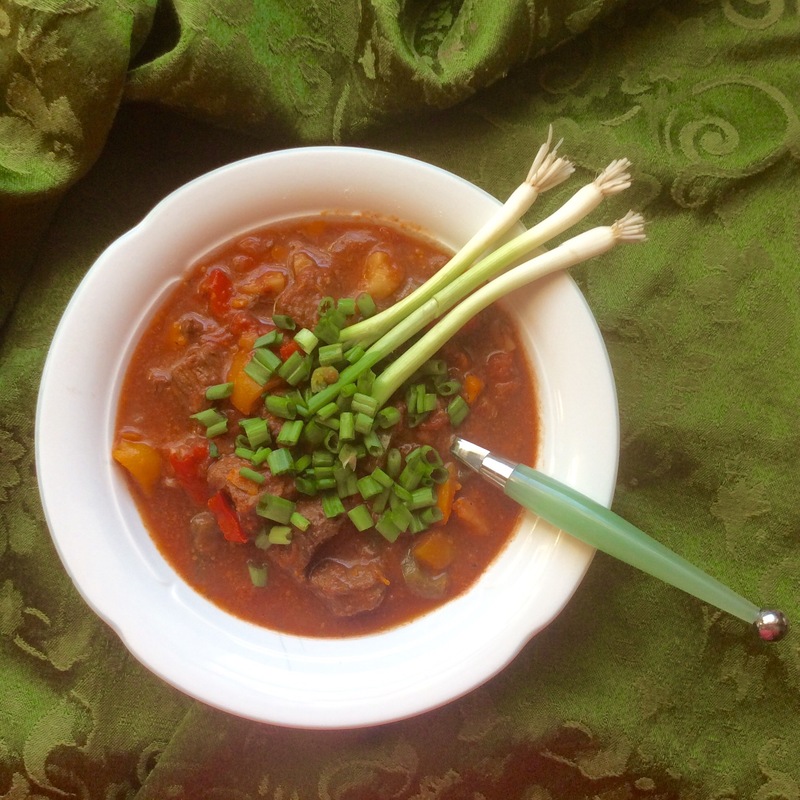 That’s where I was introduced to it – growing up in Germany, this stew was a staple on Mom’s meal plan. 1. Dice the onions (or take the bag out of the freezer 😉), cut the meat and the potatoes in chunks, and the peppers into appr. 1″ x 1″ pieces. 2. Saute the onions in hot oil until they are a nice golden brown. Add meat and spices, salt, pepper and garlic. Simmer 5 minutes, stirring occasionally. 3. Add 3 cups broth, and simmer for about an hour. 4. After an hour stir well, then add the potatoes, bell peppers, and the rest of the broth. 5. Simmer for another 30 minutes, add the tomatoes, bring to a light boil, season to taste….and you’re done! 🤓 Dig in and enjoy! I prettiet up each bowl with green onions…. It’s doubtful that you’ll get complaints about serving leftovers 😋 so go ahead and make a double batch….I do!